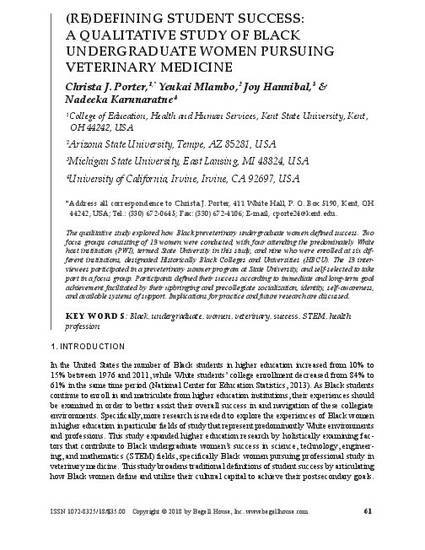 The qualitative study explored how Black preveterinary undergraduate women defined success. Two focus groups consisting of 13 women were conducted, with four attending the predominately White host institution (PWI), termed State University in this study, and nine who were enrolled at six different institutions, designated Historically Black Colleges and Universities (HBCU). The 13 interviewees participated in a preveterinary summer program at State University, and self-selected to take part in a focus group. Participants defined their success according to immediate and long-term goal achievement facilitated by their upbringing and precollegiate socialization, identity, self-awareness, and available systems of support. Implications for practice and future research are discussed. Porter, C. J., Mlambo, Y. A., Hannibal, J., & Karunaratne, N. (2018). (Re)Defining student success: A qualitative study of Black undergraduate women pursuing veterinary medicine. Journal of Women and Minorities in Science and Engineering, 24(1), 61-80.